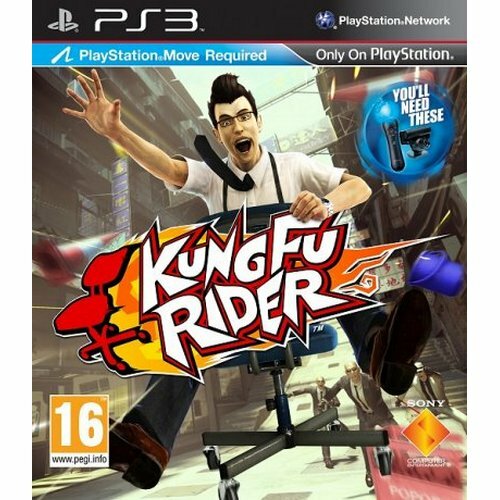 Buy Kung Fu Rider for PS3 in India at the best price. Screenshots, videos, reviews available. Kung Fu Rider sends players on a wild ride through the busy streets of Hong Kong. Taking on the role of private detective Toby or his assistant Karin, players find themselves on the outs with the mob. When Toby and Karin are confronted by mobsters at their detective agency, players have no choice but to grab their office chairs, hold on tight and slide through the streets in order to make a daring escape. Slide solo in single-player mode or have a friend use a PlayStation Move motion controller to aim a “target” around the screen in order to collect items and fend off enemies in the offline multi-player ‘co-op play’ mode.